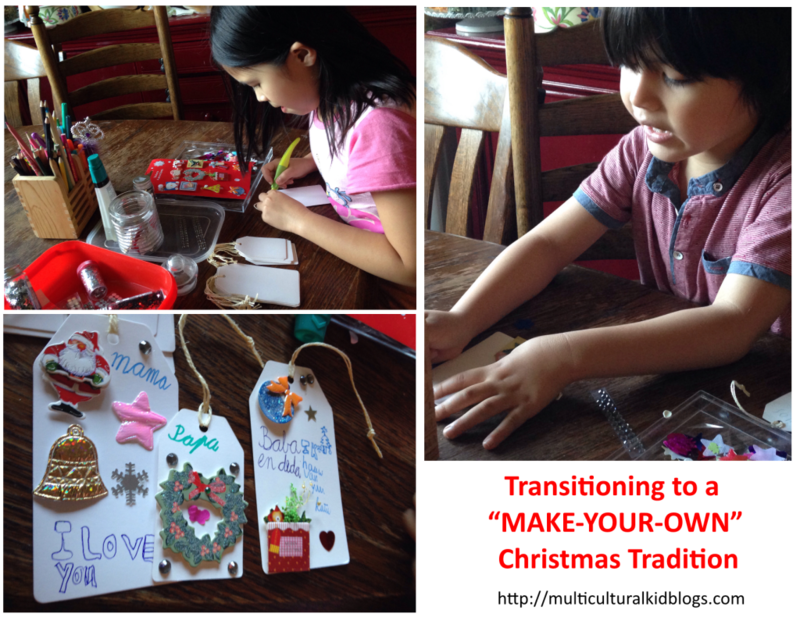 With the children growing up we have started a Christmas tradition of “making our own” Christmas decors, cards or gifts. The past two years we have slowly introduced the notion of buying less store bought gifts and last year, we have started giving them a “budget” to buy gifts for family members. Now at age 6 and 7, they are more than ready to experience a far different Christmas celebration and hopefully something that we can keep in our family. 1) Make salt dough Christmas decors. For those new to salt dough, the Easy Salt Dough Ornaments Tutorial from Imagination Tree is a good start. 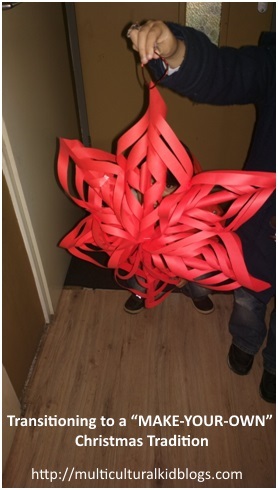 2) Make a “parol” – Christmas lantern from the Philippines. Open Wide the World wrote a wonderful post on “Maligayang Pasko, Merry Christmas Filipino Style” for the MKB Christmas in Different Lands Series where a video tutorial of how the parol can be made. For those who are more pictorial, here is a step-by-step guide on how to make a parol that I wrote for The Art of Home Education. 3) Make DIY cookie jars as gifts. 4) Make brownies for the teachers in school. 5) Make playdough to give as gifts. While making the playdough we might as well conduct a little experiment on “What Makes Edible Playdough” from Lemom Lime Adventures. 6) Do a painting as a gift. 7) Make Christmas cards and tags for gifts. 8) Make salt scrub as gifts. 9) Cook a meal for the homeless. For my birthday, we decided to Teach Gratitude through Service to our children by participating in a local cooking drive to feed the homeless during winter season. It made an impression to the children and I am glad that this is something that they would like to do again for Christmas. 10) Make a chest rub as gift. 11) Make a paper mache bowl. 12) Make geoboard constellation kits as gifts. 13) Make portable write-on blocks as gifts using old wooden blocks. 14) Make i-spy bottles for the babies as gifts. 15) Make homemade finger paints as gifts. 16) Make our own poinsettias. I also just found out that there is a Legend of the Poinsettia children’s book by award winning author and illustrator, Tomie de Paola that talks about a Mexican legend of how the poinsettia came to be because of an unselfish act of a young child. 17) Make hand warmers. You can find the simple tutorial on how to make hand warmers from just cloth, rice and essential oils from momSCHOOL’s post on Easy Gifts for Kids to Make. Super easy yet a wonderful idea to make. 18) Make a t-shirt or yarn braided necklace as a gift. This is also from the same article on Easy Gifts for Kids to Make and what is wonderful about it is you get to use old clothes. It’s not just recycling it but upcycling! 20) Make friendship bracelets. This Pinterest Board have tons of great ideas from simple to complicated steps. 21) Make homemade lip balm as gifts. 22) Make finger puppet kits as gifts. This one got the kids excited on whom to give the kits to. 23) Make memory game to give as gifts. 24) The tinkerer in me couldn’t resist adding this marshmallow shooter kit as gifts. I am excited to see how their face will light up when we make this activity! We will be using these ideas as a countdown till Christmas list of activities. 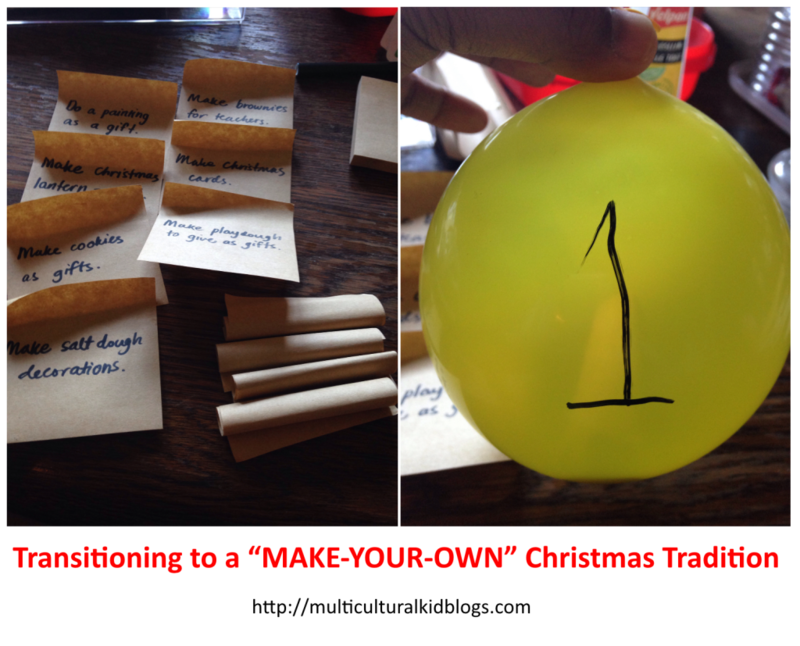 I decided to make it more fun by putting a piece of paper in a balloon and letting them pop it, one for each day of December leading to Christmas. As I write this, the kids started on making their gift tags and making a list of people to make gifts for. I am sure we will need more than 24 days to get ready for all the people they want to include in their list. But the best part of it all is we are going to make them together as a family. Lana Jelenjev is a freelance educational consultant who recently got diagnosed with breast cancer at the age of 37. 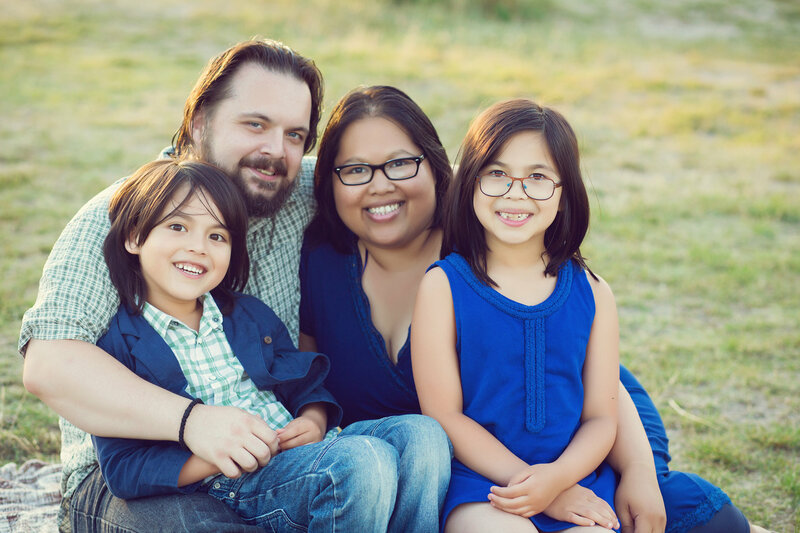 She blogs about her activities with her children at Smart Tinker. Lana recently started writing about her musings on parenting at Goodness,Grace and Gratitude, as she navigates through a new territory of hospital visits, a whirlwind of feelings and in finding compassion as she battles breast cancer, a disease that her mom succumbed to at age 49. We’ve partnered with 30+ fabulous bloggers to bring you a special holiday series packed with crafts, activities, and festive family traditions. We’ve put together a phenomenal giveaway to help knock out your holiday shopping. From 11/3–11/17, you will have the opportunity to win 1 of 4 prize bundles for men, women, kids, and babies! 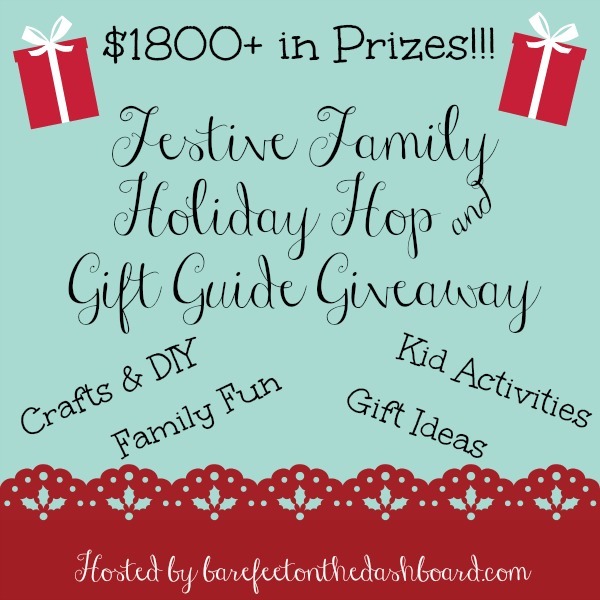 The 4 prize bundles, valued at over $1,800, include gift certificates, toys, jewelry, and more! For more details, be sure to visit the main page on Bare Feet on the Dashboard, the creator and host of this event. Be sure to enter our giveaway! Thank you for this list of wonderful ideas. It’s a lovely tradition for a family and quite inspiring! What a great round up of diy gifts! The memories from making your own Christmas decorations and gifts last way longer than the memory of buying them at the store! Great round-up! Lovely ideas! I’ll definitively use quite a few of them. Beautiful parol! I remember growing up in the Philippines and seeing so many intricate parols, complete with see-through paper and lights inside. My nieces actually made something similar to the one photographed here in school! Nina I come from Pampanga where we have the lantern festival! It is truly one of the delights to see during Christmas season! Impressive decoration crafts i must say. I would love to make one of them for this christmas. The best thing is this children can also help you in it.